Hope you can join us or let us know if you would like a talk to be held in your local area! The Crystal Earthworks held its third meditation last night to help the whales currently being hunted in the waters of Antarctica and the Western North Pacific. Thank you to all those who joined in to help these beautiful animals and please spread the word about what we are doing as the more people who connect into each meditation the more powerful the effect. The fourth and fifth meditations will be on the 22nd of February and March respectively 2008 to cover the whole of the hunting period. Please visit the link to Greenpeace if you wish to follow the ship and its current work. This meditation will use a selenite heart and chrysocolla crystals - please use the image below as a positive focus. 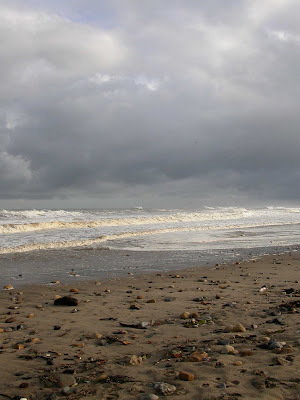 Also a reminder that the third of our special meditations for whales will take place tomorrow night - the 22nd January - further details for this are on The Crystal Earthworks website news page (see links). A big thank you again to everyone connecting in to this powerful way of working! Programmed tanzine and topaz aura crystals were planted in North Yorkshire, England this week. The former to a community centre and the latter to a library. This is part of the foundation work for two new community planting projects shortly to be announced. The aqua aura crystal planting project is going from strength to strength - thank you to all those who have contributed to this and who have sent in such wonderful feedback about planting these crystals and using the personal aqua aura crystals for carrying and meditation. Full details of this project are available on the Crystal Earthworks Website - see links. Sharing crystal planting experiences is always a joy and this description was sent in towards the end of Autumn last year by a connection in Scotland who had visited The Glass House Mountains in Australia and planted an aqua aura there for the project - very inspiring! 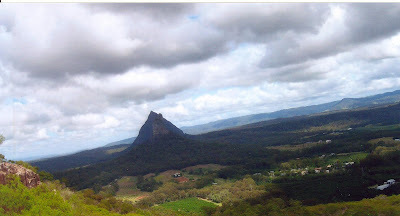 'I planted the aqua aura on Tuesday 23rd October in the Glasshouse Mountains in Queensland, at the foot of one of the mountains called Ngun Ngun (an aboriginal name). The area is stunningly beautiful with an amazingly wide variety of tropical and sub-tropical vegetation, ranging from eucalyptus to frangipani. The area is also home to a huge range of wildlife including the wonderful parrots, eagles and the gecko, echidna, and the goanna (one of which came to introduce itself to me shortly before I planted the Crystal!). Reports received of Planting for Peace to a house in Hebden Bridge West Yorkshire and planting for positive change to a small hamlet on the North Yorkshire Moors this week. Planting for Peace uses rose quartz crystals and just as it is safe for anyone to wear or carry rose quartz, any site can be planted for peace using this configuration. An explanatory leaflet and accompanying programmed crystals are available via mail order from the Crystal Earthworks website. Planting for Positive Change uses amethyst crystals and can be used to any wasteland site, area that is run down or to buildings that are derelict. The crystals help to absorb and redirect earthward any negative energy held to such areas and draw in positive energy for regeneration. The Meditation to send peace and healing to the people of Kenya (see last weeks posting) was repeated on Monday night as part of the regular Crystal Earth meditation programme. This beautiful part of our globe and her people still face unsettled and challenging times and a further repeat of this meditation will be held on Thursday 10th of January through 8pm. A combination of amethyst and rose quartz crystals will be used - rose quartz for peace and amethyst for protection. 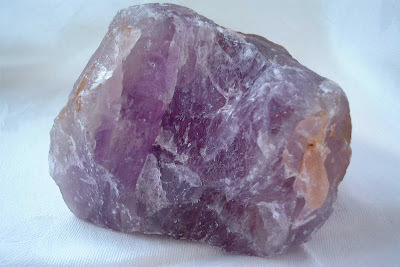 Please use an image of rose quartz (see recent postings) or amethyst as a positive focus - further details are available on the projects website Crystal Earth meditation page. It was lovely to receive crystal planting records this week in and amongst the New year celebrations - a big thank you to those of you who were in touch! Received confirmation of planting for peace and aqua aura planting to the Peace Gardens in Manchester city centre, UK in early November and also tanzine aura placed to city art gallery in Liverpool, UK this week. Further details of how to begin to plant crystals are available on the projects website - I also hope to provide some direct links from the blog to The Crystal Earthworks crystal planting leaflets shortly - just need a further IT lesson! The leaflets and accompanying crystals are currently available by mail order from the website. 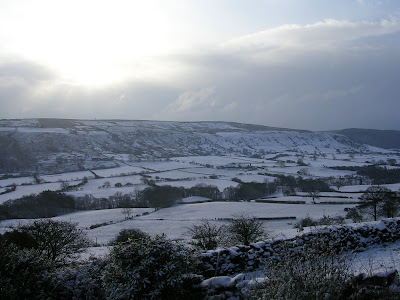 To finish, it snowed on Thursday- first real snowfall of the winter here - the North Yorkshire moors looked really beautiful and we all had great fun sledging! The meditation will use rose quartz and celestite crystals. Rose quartz is a bringer of peace and celestite is for angelic connection. Please use the image of celestite below or an image of rose quartz (see last posting to blog for this) as a focus. If you are new to working in this way, the Crystal Earthworks website meditation page* provides further details about how to join in. Anyone, anywhere across the globe can contribute to these meditations to help others in need and the more people who connect to each one the greater the healing potential. Wishing every one a happy New Year and hoping that our beautiful Mother Earth and all her inhabitants will experience greater peace in 2008. Thank you to all those who connected in for the meditation for the people of Pakistan. I felt an amazing, sense of peace touch the very earth of this country during the meditation. It was as if the land and her inhabitants all breathed a momentary sigh of relief from the challenges facing them and I felt very humbled to have the opportunity to work in this way. 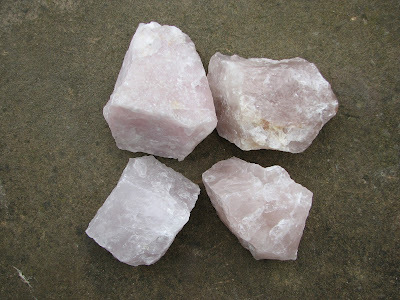 The potential healing that such crystal meditations offer is great and although meditating directly with crystals to send help requires experience and regular meditation practise, an image of rose quartz can be used by anyone, anywhere to focus on peace for them selves or for others in need. I hope you feel drawn to using an image of rose quartz in this way or joining in with the projects regular Crystal Earth Meditations, that each and every one of us may contribute to building greater peace for all through out 2008.